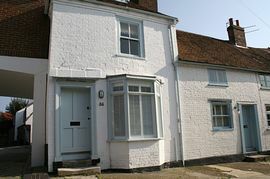 Originally a fisherman's dwelling, Grade II listed Mariners Cottage is just yards from Emsworth slipway in Chichester Harbour. The cottage sleeps up to six with two bedrooms and a lounge with a futon. 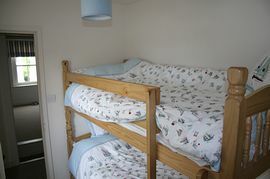 The master bedroom features a double bed, the second bedroom has bunks and a view over the harbour. The first floor bathroom has a bath/shower and is accessible via the steep stairs; not suitable for the infirm. The kitchen has a large cooker and a washing machine. The cosy lounge has a TV/DVD. The cottage has full gas central heating. The rear courtyard provides secure parking for a family car or a dinghy which can easily be wheeled down to the slipway, yards away. Excellent pubs and restaurants are just a few minutes walk away; as well as local bus services and walks around the harbour. Mariners Cottage has a lot of repeat guests who enjoy its unique position and the charm of a 200 year old cottage in one of Hampshire's premier locations in an area of Outstanding Natural Beauty. 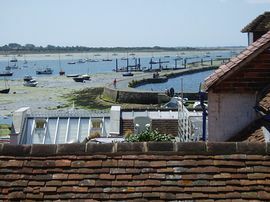 Emsworth is famed for its wildlife, popular with birdwatchers, and for sailors who patronise the two sailing clubs nearby. Location just yards from the waters edge . Charm of a 200 year old cottage. Courtyard providing secure parking for one car or a dinghy. Emsworth railway station is to the north of the village. When you enter the old village turn towards the harbour and proceed down South Street. 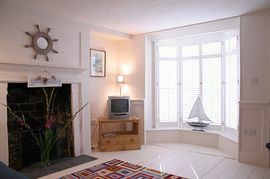 Mariners Cottage is just yards from the waters' edge on the left hand side. High Season: up to £750.00. 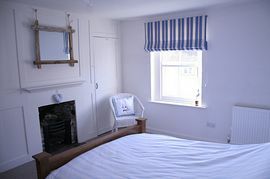 "Thank you so much for the use of Mariners Cottage at the weekend - it was perfect for us and we had a great time exploring and re-visiting old haunts. It was so good to arrive somewhere that was exactly as described and fulfilled all expectation. We had a lovely time and hope that we may come back again. Many thanks again." Annabel.